Has this ever happened to you? You lean in for a kiss with your significant other, and suddenly all you want to do is back away! Your loved one's breath could make skunks cry, it's so bad. What makes breath smell? Here are some of the most common reasons. Poor oral hygiene. When you eat, particles of food get stuck between your teeth. If you don't brush and floss properly, then a collection of bacteria called plaque hardens into tartar. The tartar can inflame your gums and cause the bacteria to break down the tooth as well as the gum tissue and bone around your teeth. All of that decay gives off an odor. You need to brush at least twice a day and floss every day, making sure you get around the back molars, under any bridges, and in any other hard-to-reach spots so bacteria don't have a chance to accumulate. Your diet. You know that eating garlic, onions and curry can leave you with bad breath. But did you know a high-protein, low-carb diet can also cause it? Low-carb diets can cause your body to go into ketosis since your body burns fat instead of glucose for energy. During ketosis, the body creates ketones, which can dull the appetite, cause bad breath and even cause organ failure. There's another way your diet can affect your breath. Some foods cause acid reflux, which can be malodorous. Smoking and tobacco products. No matter how many breath mints you pop, it's hard to disguise the smell of chimney-breath. Not caring for your dentures properly. "Some patients like to sleep with their dentures or partial in, which can lead to a yeast infection," said Lola Pimentel, DDS, a dentist in Morrow, Georgia. "Also, if you have a retainer or a denture, you need to keep it clean of bacteria by following your dentist's instructions. I see a lot of patients use an abrasive, like baking soda or hydrogen peroxide or even bleach, on their device, which is not recommended because it breaks down the acrylic and causes the apparatus to smell." Respiratory tract infection. The post-nasal drip can impact your breath. Brushing your teeth can help diminish the odor. 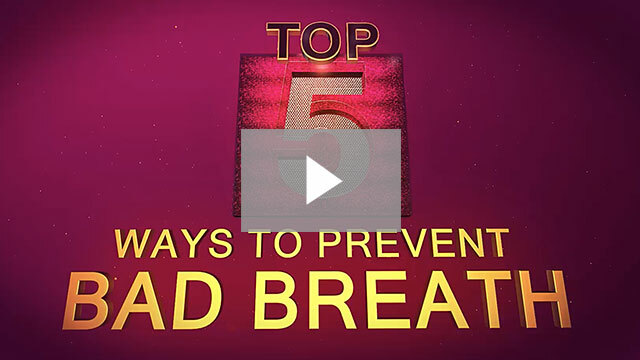 The bad breath should go away once you're healthy; if it doesn't, check with your dentist. Dry mouth. Some systemic diseases including diabetes can lead to dry mouth. Some medications can also cause the problem, such as antihistamines, which many people take for allergies. When you have dry mouth, you don't have as much saliva. Saliva is needed to help neutralize the bacteria in the mouth, and to flush it away. If it can't do that, then the bacteria flourishes and the smell it gives off intensifies. If you do have dry mouth, drink plenty of water and try chewing sugarless gum to stimulate saliva production. "Patients need to understand that bad breath is not normal," said Dr. Pimentel. "They need to visit their dentist to rule out a health issue like tooth decay or gum disease." If you wear dentures, your dentist can also inspect the condition of the apparatus to ensure it's not the reason for your bad breath. The goal is to find and treat the source of the problem, so you can have a healthy, happy and sweet-smelling smile! You, and the people around you, will appreciate it. Lola Pimentel, DDS, provides general dentistry services to patients age 6 and older. Services include bone grafting, dental implant restorations, professional teeth whitening, extractions and veneers. She practices at Coast Dental Morrow, 5656 Jonesboro Road, Suite 103, Morrow, Georgia, 30260. The office number is (678) 422-6967.